The Foya Branca. the only beach front hotel is out near the airport. This forms one side of the main square Placa Novo and is owned by the same group that operates the Orizontes in Sal. 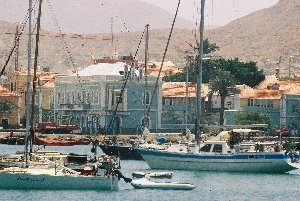 It is close to banks shops, restaurants and bars and just 100m up from the harbour area, where yachts are moored. 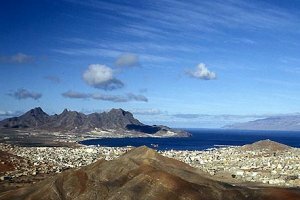 It is about 800m from the Ferry terminal for Santa Antao and so a good staging point for trips to Cape Verdes' only remaining verdant island. Some rooms overlook the pool, which is medium sized and others a small garden area in front, above the street. They are basic with wood floors and simple furniture. We got one of the ones looking into the rubbish storing area, with a tiny balcony. Service is poor and it has missing bath and basin stoppers, indicative of poor management. But it does have baths as well as showers and bidets. The food is acceptable but served in a buffet, which can be a bit of a scrum when large parties of Danes or Germans are passing through.prices from £200 per person per week. A taxi to the beach at Baia das Gatas (no cats to be seen) costs £8 and the same taxi will collect you again. 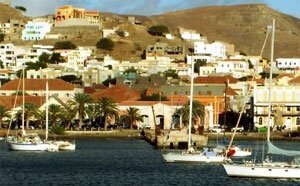 "We stayed three nights in the Porto Grande which unfortunately coincided with a large medical conference. The hotel seemed far more interested in satisfying the needs of the conference delegates and as a result we did feel we were very much second class guests. One particular night we were asked to move from where we were sitting in the bar because the group would all be coming in to listen to the live music and wanted our table! .... Having said that the hotel is in a great location with good facilities although if you are on the second floor bear in mind there are no lifts! The rooms are basic but adequate for a short stay, there is a good gym and the pool has plenty of sunbeds with free towels available from reception. 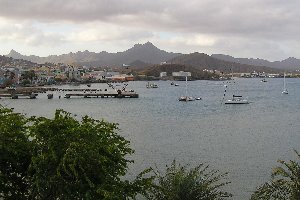 The time we were there was very windy which was a shame as this restricted beach visits, but we did enjoy a day touring the island - there is not much to do in Mindelo itself, a walk round the fish market and the centre only takes a morning or so! Be warned that there are a lot of child beggars hanging around outside the hotel - we were told not to give them money but rather pens, paper or simply sweets." This is owned by a Francophone Mme Loutcha. It is out on the edge of town towards Baia das Gatas, so is a bit of a hike on foot. 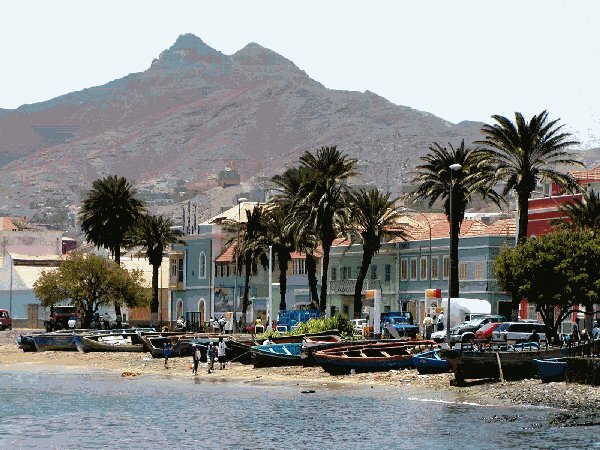 But it has possibly the best food in Mindelo, a mixture of Senegalese, French and Cabo Verdean. Dinner costs only £6 or 7 and the wine is fine. The Hotel offers a beach buffet and barbecue along the coast on Sundays. Locals come to eat dine and a guitar, violin and tenor group performs on most evenings. The bed rooms are large and old-fashioned a little dark and gloomy but perfectly comfortable and quiet. The plumbing is also old but seems to work most of the time. Madame is always on hand to sort things out. Prices from just £85 per person per week..
P from Liverpool liked the hotel and the island in spite of the usual problems with TACV. 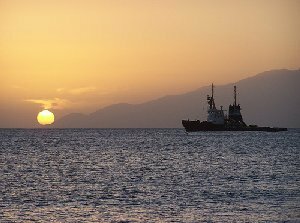 "Our flight back from Sao Vicente was cancelled and so we had a second night there after all. We had to work hard to get them to get us back to Sal on the Sunday. We did actually get onto one plane and sit in our seats only to be evicted again! We finally got back to Sal at 4ish on Sunday afternoon and the Hotel Pontoon allowed us to use one of our vouchers for one of the nights we missed so that we were able to put our luggage in a room and have a shower. Chez Loutcha was very clean and the staff very accomodating so no complaints there. We loved Sao Vincente and have hopefully secured two pieces of land, which was our mission. We are now looking at getting our families out to see exactly what it is all about." This is perched up on a hill near the old British Consulate and above the area where coals were stored when Britain and steam ruled the waves. It has the best view of any hotel and is not far from shops and bars. It is called a Residencial in Portuguese which implies value rather than luxury and it does offer some very economical suites for 4 people on the top floor. It is built around a small, cool courtyard and some rooms give onto this whilst others face the sea. The owner's ancestors were Cornish aristocrats called St Aubyn, but he has lived in Senegal and speaks better French than English. It is clean, correct, reasonably central and with nice views and an attentive manager. prices from just £85 per person per week.